From Gold Chains for Men to Gold Reserves: Who has All of the Gold? Karus Chains writes: At Karus Chains we love to write about anything associated with gold chains for men and what could be more central to gold chains than gold itself. So we asked the question- who owns most of the gold? Of course an open question like this will only throw up more questions. Should we look at the countries that mine the most gold, or the countries that buy the most gold? Should we look at countries that export the most gold jewelry or the countries that import the most gold jewelry? There is a lot of data out there that can answer all of these questions, but in the end we decided to focus on answering the following question: what countries have the largest gold reserves? 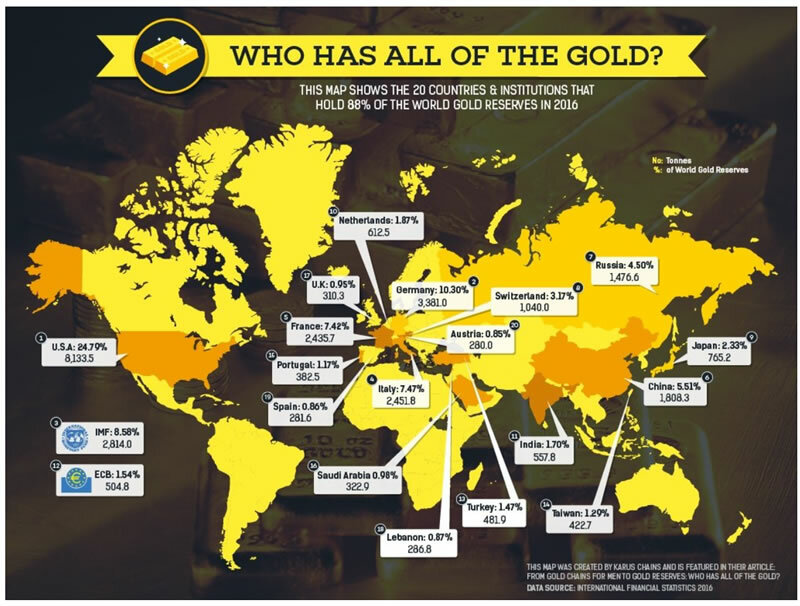 We designed this map that shows how 88% of the total gold reserves are held by 20 countries. Gold reserves are not always physically stored in the named country. For example Germany has a large portion of its reserves stored in the USA, the UK and France. It should also be noted the practice of gold leasing by central banks can call into question the accuracy of the reported figures. The map does not list all gold holders: countries which have not reported their gold holdings to the IMF in the last six months are not included, while other countries are known to hold gold but they do not report their holdings publicly. A gold reserve is the quantity of gold held by a central bank to support the issue of currency. Historically a country's gold reserve was central to its financial well-being and status. However the importance of gold in this regard has declined as the amount of gold held by central banks has decreased and for the most part gold reserves do not form a significant portion of the central bank's foreign reserves. Despite this, gold is still a very important commodity and continues to play a central role in the world’s economy. This was most recently evident in the aftermath of the 2008 crash when central banks reversed a 20 year trend of selling their gold and instead started buying gold in an effort to protect their nation’s wealth.